The largest known asteroid could contain more fresh water thanEarth and looks like our planet in other ways, according to a new study thatfurther blurs the line between planets and large space rocks. 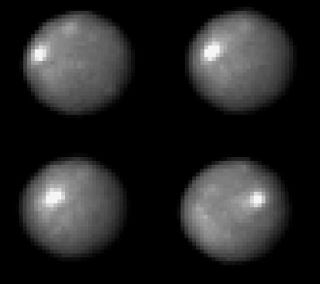 Astronomers took 267 imagesof asteroid Ceres using the Hubble Space Telescope. From these images andsubsequent computer simulations, they suggest Ceres may have a rocky inner coreand a thin, dusty outer crust. A team led by Peter Thomas of Cornell University said todaythat Ceres is nearly spherical, which suggests that gravity controls its shape.Also, the asteroid's non-uniform shape indicates that material is not evenlydistributed throughout the inside. These and other new clues, including Ceres' low density, pointto an interior loaded with frozen water, the astronomers said. The results are detailed in the Sept. 8 issue of the journal Nature. Ceres has long been considered one of the tens of thousands ofasteroids that make up the asteroid belt between Mars and Jupiter. At 580 miles(930 km) in diameter – about the size of Texas – it's the largestasteroid in the belt, accounting for about 25 percent of the belt's totalmass. Astronomers had thought Ceres might never have been heatedenough to create layers of material. But computer models now suggest Ceres has a differentiatedinterior – dense material in the core and lighter stuff near thesurface. Possible configurations include a mantle rich in water ice around arocky core. If this mantle is composed of at least 25 percent water, Cereswould have more fresh water than Earth, according to a statement released bythe Space Telescope Science Institute, which operates Hubble for NASA and theEuropean Space Agency. "The most likely scenario from the knowledge we have onhow other objects form, it probably has a rocky core and a mantle. That mantleis probably some watery, icy mix, with other dirt and constituents. That mantlecould be as much as ? of the whole object," study coauthor Joel Parker ofthe Southwest Research Institute told SPACE.com. "Even though it's a small object compared to Earth, there could be a lotof water." On Earth, fresh water makes up only a thin layer just a fewmiles deep in some places, less in others. The water layer proposed for Ceres,while smaller in circumference, is many miles thicker. The total volume of water on Earth is about 1.4 billion cubickilometers, around 41 million of which is fresh water. If Ceres' mantleaccounts for 25 percent of the asteroid's mass, that wouldtranslate to an upper limit of 200 million cubic kilometers of water,Parker said. Since all the nine "regular" planets havedifferentiated interiors, this new view of Ceres has some astronomers callingCeres a "mini-planet," adding fuel to an ongoingdebate over exactly what qualifies as a planet. Other researchers recently announced the discovery of 2003 UB313,a round object in our solar system 1-1/2 times larger than Pluto and aboutthree times further away from the Sun. But even an object of this size –at 2,100 miles in diameter roughly four times the size of Ceres – doesn'treceive universal endorsement as being a planet. One astronomer, Brian Marsden, whoruns the Minor Planet Center where data on small bodies is collected, says thatif Pluto is considered a planet, then any other round worlds should also beconsidered planets. Under this definition, which some other astronomerssubscribe to, Ceres 2003 UB313 and a handful of other large objects would benamed planets. The alternative, Marsden and otherssay, is to stop calling Pluto a planet. Another explanation is that Ceres is a sort of 'baby' planet– an underdeveloped version of Earth and other rocky planets. Looked atthis way, Ceres appears as other fledgling planets might have looked more than4 billion years ago. The leading theory for planet formation holds that small rockscollided, stuck and gradually grew. Depending on location and orbit, adeveloping world may or may not have encountered enough raw materialto become as large as the four traditional rocky planets. "Ceres is an embryonic planet," said observation teammember Lucy McFadden of the Department of Astronomy at the University ofMaryland. "Gravitational perturbations from Jupiter billions of years agoprevented Ceres from accreting more material to become a full-fledgedplanet." In 2015 scientists will get a close up look at Ceres when theNASA Dawn mission orbitsthe asteroid. A closer look should provide more clues about the asteroid'scomposition. Asteroid Vesta: The 10th Planet?